Simmered Baked Beans with pieces of crispy bacon, red and green onions, and garlic. Perfect for bringing to your next summer gathering! Which happily transfers to, eat-outside-with-family-and-friends time! Isn’t it just the greatest time of year? You get to chill and eat while chatting it up with your besties… outside! After being cooped up all winter long, I’m so ready to get out and enjoy every minute of our very short summer. 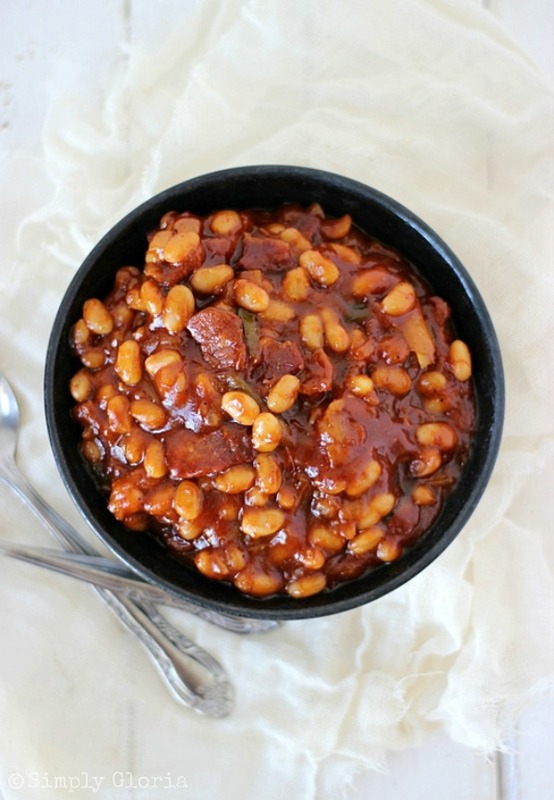 The next time you are invited to a gathering, bring these amazing Baked Beans with Bacon. Your friends will love you for it. And of course, it’s beyond easy to put together. Super tasty and has lots of flavor. There’s tender white beans, crispy bacon, red and green chopped onions, and the fresh minced garlic. It’s all simmered in a thick, rich sauce. If you’re like me, I like to keep my baked beans in one spot on my plate. Can’t have the beans running into the potato salad or soak into the buns with the burger. Am I right? 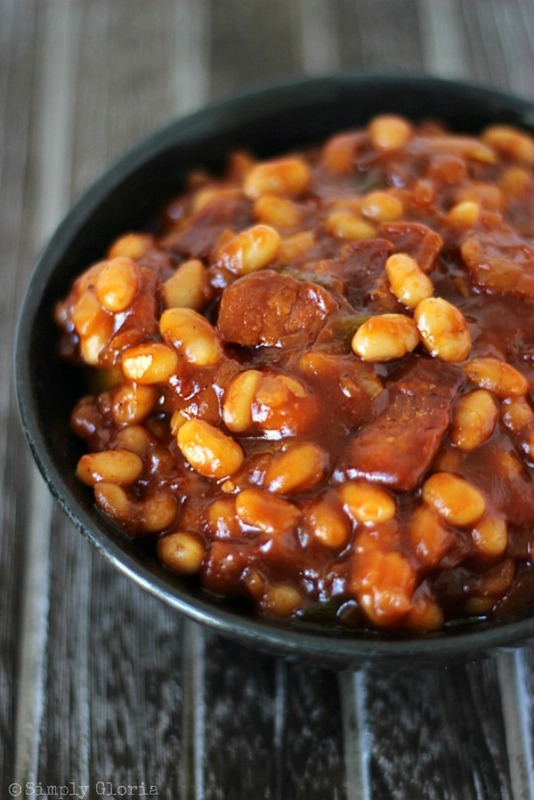 The best part about making these baked beans, there’s no need to simmer them all day. Just until everything is all warmed up and then you’re ready to serve. So there, a fast and hearty recipe to bring to your next summer gathering! Simmered Baked Beans with pieces of crispy bacon, red and green onions, and garlic. Perfect for bringing on your next summer gathering! In a medium pan on medium-high heat, cook cut up bacon pieces until golden and crispy. Drain cooked bacon onto paper towels. Leave 2 tablespoons of bacon drippings in the pan and sauté the shallot, red onions, green onions, and garlic together for 3-5 minutes. Add the drained beans, bbq sauce, ketchup, brown sugar, dijon mustard, worcestershire sauce, apple cider vinegar, and seasonings. Stir until combined. Simmer on low for 15 minutes. If it is too thick, add a tablespoon of water at a time. The longer it simmers, the thicker it becomes. May set in a slow cooker on the lowest setting to stay warm. Enjoy! Serves 4, but may easily be doubled or tripled to feed a crowd! I am definitely making these for the next cookout we go to! They look so good and full of flavor! We get baked beans in tins over here in england but they’re in standard tomato sauce and don’t look even half as good as these! I love Baked Beans being from Boston it’s like a religion. Haha! I learned a recipe from a southern man while in Germany for baked beans with bacon. It was so good and I am hooked. I’ll need to pull out the recipe to share. I saw the first pic and now I am dyin’ for a bowl of this. Totally reminds me of summer! These look amazing Gloria!! I can’t wait to give this recipe a try 🙂 I don’t even have a BBQ, is it ok if I just make this dish just to eat by itself…? This is a lot like my mother in laws recipe and it’s one of my favorite things in the world! Yummy! Thanks for linking it up! Yay for grilling season! I love this time of the year! 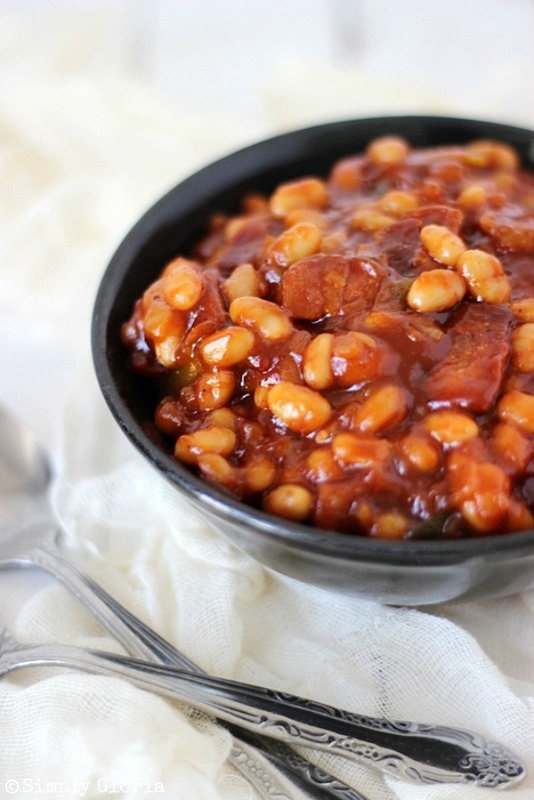 And these baked beans look so good … I haven’t made baked beans in so so long! YES, i’m a baked bean freak. I just love them SO SO much! Always have. I love all the spices and flavors you added Gloria! I totally feel ya with not wanting your beans to run into all your other food. Totally annoying! However, I usually want to eat beans so bad I still always make room on my plate and roll my eyes when it runs all over everything else! Guess we should just buy those separated plates, eh? Thanks so much for a bean recipe! Pinned for later, thanks lovely! Hope you’re having a wonderful week! I’m seriously craving baked beans now! And of course my husband would say that you can’t make them without bacon…I agree. 🙂 Yummers. Gloria, someone is standing right behind me this moment and I think he’s actually drooling on my shoulder! This look simply fantastic!! 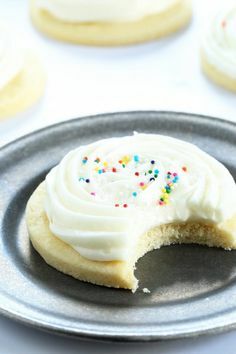 Pinning, of course and thanks for sharing! Nothin’ like a good batch of baked beans! These look SO good! Gloria, these beans look delicious! My husband loves baked beans and is always asking for them whenever we BBQ. I’m definitely trying these. I love how saucy they are 😀 Pinning! Marti recently posted…Grow Your Social Media Party! I love LOVE baked beans! It’s not summer without them 🙂 And so happy to finally be to grilling season! I love that you added bacon to these 🙂 Pinned! 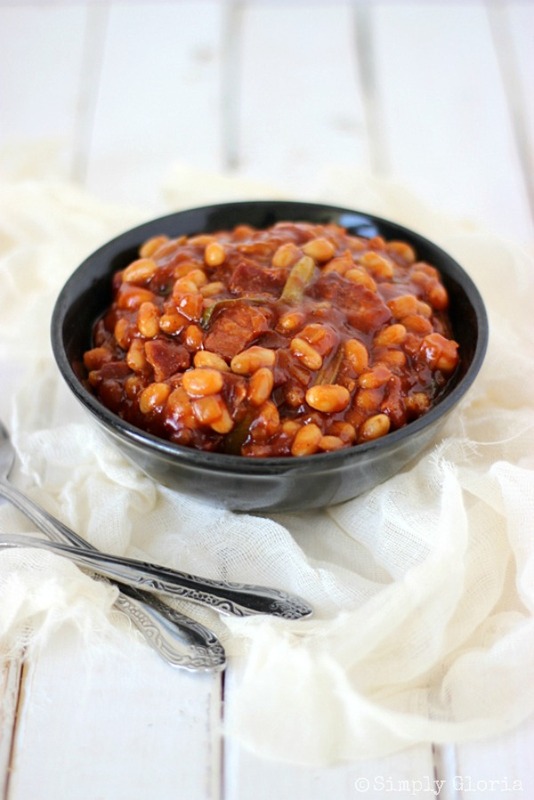 I love baked beans and these look delish! It is so funny that we use several of the same ingredients. I love that you added a little bit of spice!! I will try these!! Thanks for sharing. It looks divine! Yes! Summer is the best! I wish it was longer though. These beans are the perfect summer dish. Just made this recipe today for a cookout and was a big hit! So delicious! Apple cider vinegar added a nice tang to the sauce. The beans had a nice yet not over-powering BBQ flavor. Highly recommend this recipe for your next cookout!